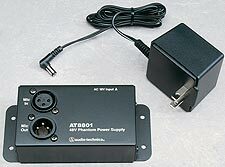 The AT8801 provides 48V phantom power for a single microphone. It is an in-line powered device that allows the use of remote-powered microphones with recorders and other devices that do not supply phantom power. *PLEASE NOTE - Our picture shows an American AC power module because we do not have a photo of a UK version. Naturally we only supply the AT8801 with a UK version that has a proper British 3-pin mains plug, not the American version!